The Wishbone Video Playbook is a series of videos which gives you in-depth video instruction on how to install the Wishbone Offense. The video playbook is hosted on Vimeo (laser fast load speed) so that you can teach your coaches and players the offense visually. It can be viewed on your smart phone, tablet, or even downloaded and saved on your desktop or laptop. This playbook video series can be easily accessed at anytime or any location (like the practice field or a meeting room). We recommend downloading the Vimeo App. You can sign into Vimeo with an email address or using Facebook. Once signed in, you can purchase the video series. 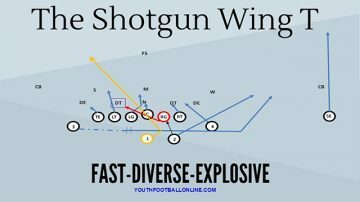 Learn More/Download: Wishbone Video Playbook For Youth Football from Youth Football Online on Vimeo. Wishbone Playbook PDF, with play diagrams and blocking rules. Purchase also includes PDF file of the Wishbone Playbook (so you can print it out and give it to your coaches, players, and/or parents). Following purchase, be sure to click ‘RECEIVE UPDATES’ so that we can send you the PDF Playbook. Video playbooks will allow your coaches and players to process and retain information much faster and with more reliability. Since the majority of people (adults and kids) are visual learners, it’s much easier to watch a three-minute video than it is to read off of a diagram. All plays in this video series are drawn up against various defenses on the whiteboard. All videos will have an open comment area were you can post questions.